On Saturday 23rd March 2019 we will hosting our first Spring event and celebrating the 1st year of being open at Kent Green Methodist Chapel. We officially opened the chapel on the 24th March 2018 we have now been in a full year it would be great if you could join us to see what progress we have made. 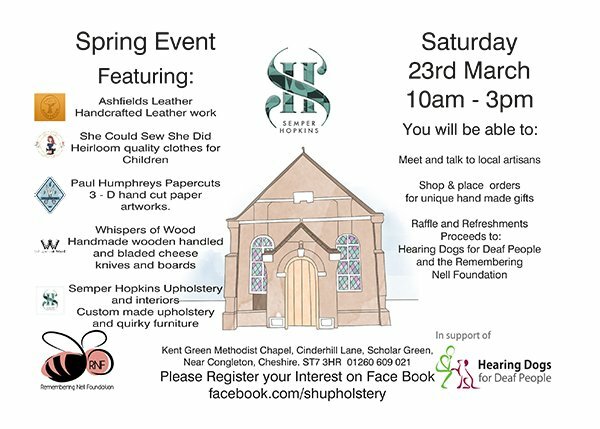 Enjoy refreshments and partake in the raffle with proceeds going to two well deserving charities The Remembering Nell Foundation and Hearing Dogs for the Deaf People. A great opportunity to meet and support four other local artisan businesses as well as ourselves. Treat yourself to something or buy a special gift for a loved one. We will be celebrating our 1st year of being in the chapel.